A little something cosy but super healthy for those moments when you're not sure if it's Winter and Spring. Melt the coconut oil and add the carrot and red onion. I find organic carrots are a lot more tasty and sweet if you have them. Allow the vegetables to fry gently for about five minutes. Add the crushed garlic and cumin. Stir and allow to cook for a couple of minutes. Add the water and simmer for ten minutes or so until the carrot has softened. Add a squeeze of lemon juice and season to taste. Enjoy in a mug with warmed sourdough bread while curled up watching your favourite box set. Note: I adapted this recipe from one I found on Abel & Cole's website as I didn't quite have the right ingredients - click here to see the original recipe. "Come in." Two short words heavy with meaning. Step out of the big, bad wet world and into my home. You'll be safe here, toasty and well fed. "Come in." They are two of the loveliest words to say and to hear. I settled down with some echinacea and elderberry tea and homemade ginger, cinnamon and nutmeg biscuits to start reading this beautiful book. Nigel Slater is the most lyrical writer. His words are the literary equivalent of curling up in an armchair with a blanket over your knees by an open fire. I received this book as a gift from a lovely friend. It's the perfect treat for start the Christmas season. Autumn makes me want to bake. 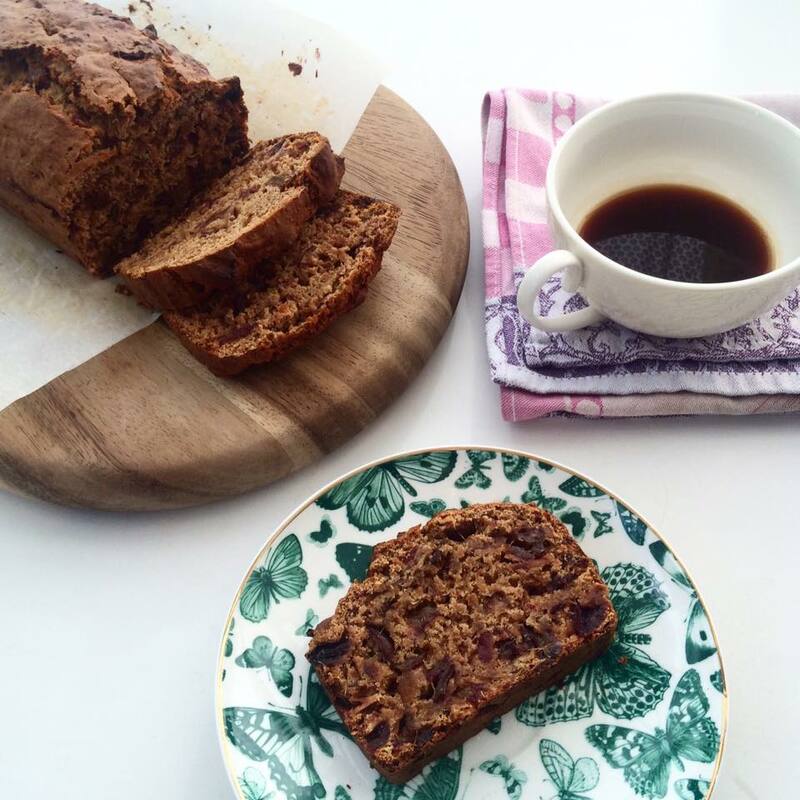 I fancied making a tea loaf and realised I had a bag of dates that needed to be eaten up so squirreled around until I found a recipe from the fabulous Nadiya Hussain online. It's such a simple recipe and all you do is soak 350g of chopped dates in 150ml of cold, strong tea overnight, then stir in 50g honey, 50g brown sugar, 1 large egg and 225g self raising flour and bake for 35 - 40 mins at 200°C/Gas Mark 6 in a lined loaf tin. I fancied adding some spices too so popped in 1/2 teaspoon of ginger and 1/2 teaspoon of cinnamon. The loaf filled my flat with the scent of spices as it baked and I enjoyed a warm slice with a cup of black coffee. Lovely. There are two types of people at this time of year, those who are mourning the end of summer and those who are giddy with excitement at the autumnal chill in the air. I am definitely one of the latter. I love bright blue skies and the sun warming my bones but my ideal time is when I can wear shades and a scarf and the leaves start turning from green to a spectrum of oranges and reds. I love slippers and layers and blankets, stews and soups and roast dinners. I spent Sunday morning embracing the change of the seasons, turning a punnet of plums and some leftover apples into compote and crumble. As always I looked up a few recipes and then made up my own, chopping the fruit and adding a splash of water, a couple of spoonfuls of light muscovado sugar, a dash of vanilla essence and a pinch of cinnamon and nutmeg. The ingredients simmered for twenty minutes and filled the kitchen with the sweet smell of spices while I read passages from Nigel Slater cookbooks. The perfect way to spend a Sunday. I don't know where I've been hiding but I've just discovered Emma Gannon's fabulous Ctrl, Alt, Delete podcast. On this evening's commute, I listened to #70, an interview with Melissa Hemsley, which was all about wellbeing, the joy of nutritional food and the benefits of meditation. An absolute treat. I'm excited to work my way through the other 90 episodes. This recipe is for when you really can't be bothered to cook but want something cosy and wholesome. Everything goes in one saucepan and simmers away while you put your feet up. It makes enough for 3 - 4 meals and tastes even better the day after you cook it. Saute the onion and garlic in a little olive oil until the onion softens. Add the spices and stir for about 30 seconds. Add all of the other ingredients to the saucepan and stir well. Grind in a little salt and pepper. Leave to simmer for 40 minutes. Serve with either brown or white rice, whichever you prefer. Curl up and enjoy! The weather really chilled down again this week and it made me crave cosy food. I've been meaning to try making ribollita for a while having seen it in a few magazines. As is my habit I mashed together a few recipes and ended up with a warm bowl of loveliness that lasted me a few days. Ribollita means reboiled and this really does taste better and better the more you simmer and reheat it. Sauté the onion and leek in a tablespoon of olive oil. Add the garlic and continue to sauté for a minute or two. Add the remaining ingredients except for the spring greens, stir and leave the ribollita to simmer for about 40 minutes. Add the spring greens and continue to simmer for another 20 minutes. Cut the bread into large cubes. You can add this to the pan and stir it in if you are serving all the soup at once. I like to add it to each individual bowl so that when I reheat the remaining soup the next day I can add fresh bread rather than let it completely breakdown. Serve and enjoy slowly while reading your favourite magazine or book. Warm approximately 400ml of full-fat milk in a saucepan with one teaspoon of vanilla essence. Take four ramekins and fill each one about a third full with pudding rice. Add 1 - 2 teaspoons of brown sugar and a small knob of butter to each ramekin. Divide the warm milk between the ramekins ensuring that you only fill to about two thirds full as the rice will expand when you cook it. The sugar and butter will separate and float a little but don't worry as cooking will ensure the ingredients mix. Sprinkle the top of each with a little nutmeg. Bake the puddings in the oven at about 160 degrees for approximately an hour. Keep an eye on them and add a little more milk if you need to. Enjoy warm from the oven with a teaspoon of jam. The recipe for these scones is from the beautiful Violet Bakery Cookbook. A friend of mine suggested making these when I was really busy at work last year. She makes them in batches and then freezes them, taking one out of the freezer each morning to cook and enjoy with a coffee. The process of making them is very therapeutic and the butter, natural yogurt and oats in them give a lovely indulgent taste. A bit like sweet porridge in a scone. There is something so comforting about eating home-baked treats. It's nice knowing what's in what you're eating (!) and along with that there's the love and care you've taken making something to treat yourself. When I'm super-busy with work, making a little time to take care of myself is super important and this recipe is just the thing to make me feel I'm doing that. After all the sweet indulgence of Christmas I start to crave vegetables and something *clean* to eat. Today I rustled up some leek and chickpea soup. I tend to make recipes up as I go along so you may want to add more or less seasoning or vary the amount of vegetables. Saute the finely chopped onion, carrot and leek in a glug of olive oil for about five minutes or until they start to soften. Add the thinly sliced garlic, stir in and continue to sauté for about a minute. Drain and rinse the chickpeas and add to the mix. Add 750ml water and half a vegetable stock cube. (You can use a whole stock cube for a stronger taste but I like to really enjoy the taste of the vegetables.) Add salt and pepper to taste and rest a bay leaf on top of the soup.